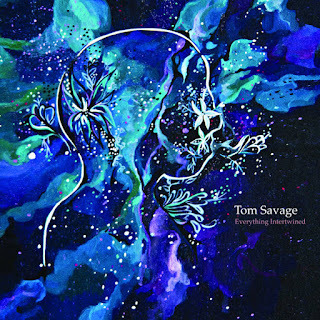 I just had the opportunity to review the most recent release, Everything Intertwined, from Tom Savage and it's a solid rock release. Opening with Forever, a rocking ballad, Savage on vocal and guitar, shows influences of Bruce Springsteen and Neil Diamond, joined by Tony Silvestri on keys, Seamus Cowan on bass and backing vocals and Bonz Bowering on drums. Title track, Everything Intertwined, is a quiet ballad with a solid melody and acoustic backing. Very nice. One of my favorite tracks on the release is Sad When You're Not With Me with a catchy melody and warm keys and strong but understated guitar. With more of a humble country rock feel, like the Band, another strong entry is Come Home with Savage's best vocals on the release. Pushing further into the rock arena, 17 Years has a rock solid bottom, twangy guitar riffs and a rocking beat. Very cool. Wrapping the release is Cold But Free, a strong ballad with a good melody and simple but effective instrumentation. This is a real nice closer for a cool release.